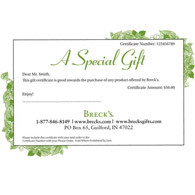 Breck's Gifts respects your privacy. You can unsubscribe anytime. Thank you for signing up for our special offers and promotions! Your 10% OFF coupon is being applied. Truly Unique and Nature Inspired! Free 10% Coupon! Join our email list and instantly receive 10% off your purchase. Join our email list and instantly receive 10% off your purchase. Order from your catalog with item numbers. We choose the fastest, most efficient way to send your order-via FedEx or the U.S. Postal Service. Large orders may be shipped in more than one package. Order with complete confidence. We select and ship only the finest quality bulbs, plants, and trees. We pack them carefully to ensure they arrive safely. If you are not pleased with your purchase, please call us at 877-846-8149 or email at customerservice@brecksgifts.com and our Customer Service representatives will be happy to help you obtain a merchandise credit. Your order is important to us, and we want you, our customer, to be completely satisfied. © Copyright 2019 Gardens Alive, Inc. d/b/a/ Breck's Gifts. All Rights Reserved.